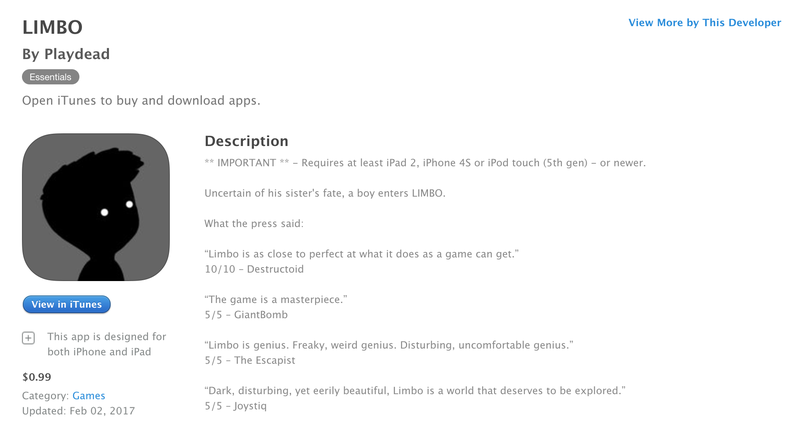 If you have never played LIMBO before, you really ought to, especially at just $1. It received critical praise for its atmospheric game world, interesting puzzles/set-pieces and emotional story. Normally $5, you can download this indie gem for just $1 to all your iOS devices for a limited time. Prefer it on Mac? Well it’s currently 50% off on the Mac App Store. While not the lowest we have seen, you can now download the regularly $10 Mac versions for just $5. Combining both of them together you get a 4+ star rating from over 15,000 gamers, and rightfully so. Here’s the new Free App of the Week, Angry Birds Star Wars for free and the entire Trine trilogy, along with some other Mac game deals. ** IMPORTANT ** – Requires at least iPad 2, iPhone 4S or iPod touch (5th gen) – or newer.